Empower your wealth with trading calls & cutting edge strategies DIRECTLY from Dr C K Narayan. Favourable trading opportunities in a day in stocks, stock futures and options, Index futures and options. A weekly report with detailed insights on the future market trends and trading opportunities for the week ahead. Although the news flow remained mixed, the market continued to push higher and achieved all time news highs in the week just ended. Although the news flow remained mixed, the market continued to push higher and achieved all time news highs in the week just ended. Nifty futures hit a new high 11859 and this continued to keep the sentiments upbeat. People were more than happy to see their portfolios revive even though the gains did not match what was happening in the main indices. The gains in mid and small cap indices were much more muted compared to the thrusts that the Nifty was experiencing. Banks were responsible for a good measure in bringing the Nifty higher. Although private bank stocks were faring well and SBI too attempted to stage a breakout, they could not quite work up then magic of the earlier weeks when they powered the Bank Nifty to new highs. Nevertheless, banks continue to hang around the high zones, holding out hopes that it would soon push ahead on its own. Likewise, IT index too is hovering near all-time highs and seems to want to push higher. Positive results in TCS could have done the trick but that was neutralized a bit by lower numbers for Infy. Wipro has disappointed some but the large quantum buybacks being announced by many IT companies should ensure that there will not be any big selling either. Hence this sector too could be in support of market moving higher in case there are some new positive triggers. Despite a much shortened week, the values managed to sustain near the higher zones. This suggests that the sentiments are upbeat and the bulls continue to dominate. How much of BJP victory in the polls is priced now will be the question. Of course we have another month to go before we shall know the answer to that one. However, the very fact that nothing seems to shake the confidence of the bulls is good enough reason for traders to continue with their buy-on-dips approach. We have chosen the following stocks for the week. TCS(Fut),Asian Paints(Fut), Century Textile(Fut),HDFC Ltd(Fut) and Godrej Industries(Fut). Winning the market is creating the right combination of information, preparation and action.Dr C K Narayan is an advisory that equips subscribers with right information, analysis, updates and recommendations to enable high returns. C K Narayan will identify trading opportunities with prospect of high potential in stocks, stock futures and options, index futures and options. This service will also highlight profitable tradable situations in the Currency and Commodity markets. The trading calls and follow up calls will be rendered through SMS for timely action. The weekly roundup report will provide detailed insights on the current and future market trends. It will outline the trading opportunities in the week ahead. Market analysis: The index column will give a detailed outlook on Nifty and Nifty Futures and the broader market trend. It will detail the important technical levels that traders should pay attention to in the following week while keeping the larger perspective in view. Stock watch: Stock Watch column analyses investment prospects in stocks, stock futures and options for the following week. Commodity & Currency watch: This section will give you a perspective on global news and events that impact the commodity and currency markets and will identify trading opportunities within them. Dr C K Narayan empowers your investment decisions. Master Analyst Service: The service is brought to you by renowned stock market master analyst Dr C K Narayan, who has an impeccable track record of 40 years. Keeping you ahead:: The service keeps you abreast of market trends and identifies trading opportunities well in time, helps you stay on top of the game. Trade with confidence: The service will simplify the process of making money by doing all the groundwork to bring to you opportunities to trade that have high prospect. So all you need to do TRADE. Scientific analysis: The recommendations are backed by in-depth market intelligence, scientific analysis using globally proven methods and usage of cutting edge charting softwares. Comprehensive Service: It addresses the needs of every kind of market player- the day trader, the multi day trader, swing trader and the positional trader. It also caters to all the segments of the market - Equity, Derivatives, Commodity and Currency. Dr C K Narayan is a veteran of stock market and is a research analyst registered with SEBI (SEBI Registration No. INH000001964). In his 40 years of experience he has dealt with major market movements and hence is well versed with strategies to get the best out of them. As Head of the derivatives desk at ICICI Securities he handled major financial institutions and FIIs. His varied business experience from smallest retail client to large FII clients gives him unique insights into the workings of the market. His views are much sought after and he has been featured as an expert market commentator on television and print media. He has also trained thousands of technical analysts across the country. 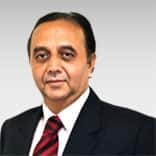 In his analysis services, Dr C K Narayan uses a unique combination of simple trend following techniques as well as the complex world of Gann and Elliot wave methods in addition to using trading systems created from proprietary algorithms. b)	Intraday Calls are for same day, Investment for duration of 0-10 days ,BTST-STBT are overnight trades and Option are for 0-7 days. c)	The entry/stop/targets levels are future price levels. d) The levels provided for Entry, Stoploss and Target needs to be implemented as received. e) Any updates to those levels relating to Profit Booking / Stoploss shall be provided if required. i)	Any other update for the open calls shall be provided as and when required. a)	The newsletter is available by Saturday Evening with a weekly perspective .The updates on trades given in the letter shall be available by Wednesday evening. b)	Views on Equity ,Currency and Commodity are covered with suitable recommendations. c)	The entry/stop/targets levels for trade ideas shall be mentioned. d)	Trades are evaluated based on their performance for the week in which recommended. Carry forward of the trade is at the sole discretion of the subscriber. The bullish bias never deserted the market , it just went undercover to resurface quite strongly last week. The resumption of the uptrend has brought the docile sector Bank Nifty back into the limelight. After the strong surge in Bank Nifty on the day of the election results way back on May 16 a clear trend could not emerge unlike the Nifty or CNX IT. Despite several attempts the trend slipped into some congestion till last week it managed to shrug the old self and reclaim some lost ground. Nifty had been moving steadily higher but was unable to really show some aggression till it received strong support from all key sectors to positively close above 7900. The momentum in Nifty is holding steady and is now heading higher beyond 8000 in the coming week. Higher levels attract volatility and with a short week as well as an expiry unfolding this week one can expect markets to witness some robust action. Nifty trades can be pursued at current levels and on decline towards 7875 keeping 7850 as the stop as we step into the week. The market continues to reward a buy on decline approach and hence one should continue to participate in this manner. Bank Nifty offers more room for a trade and in comparison is better placed to move higher and should be considered for a move towards 16100 in the coming week .One could initiate a position in this trade with a stop below 16700. Banks and interest rate sensitive counters will be the beneficiary of the surprise move seen in banking. With the Finance ministry approving a draft for creation of a holding structure for state run banks for their long term capital needs the PSU banks are in demand. With the trends just emerged in this sector one can expect that the momentum shall sustain this week too. SBI and PNB have witnessed some robust volumes amongst the Public Sector Banks while Kotak and HDFC Bank have seen a fair bit of traction amongst the Private Sector. With some cheer spreading to this sector the financial counters too saw some demand picking up. With bullish momentum play and all declines witnessing steady buying action the stocks are witnessing some robust action. Adopting a mix of breakout and support buy strategy some stocks have been selected for the forthcoming week with a trading mindset. After a sharp upthrust few days back this counter did not really continue the trend , however the steady consolidation at higher levels suggests that there is strong possibility of the prices rising higher. The momentum too is not showing any signs of weakness hence we can initiate a buying opportunity above 1270 with a stop below 1250 for a rise towards 1300 in the coming week . The bullish bias in this setup does not seem to recede. After a strong pullback the strong buying interest emerged at lower levels thereby pushing the prices to test the value area around 510. The daily chart attached show that the value area resistance is being tested. With a bullish sentiment in progress one should watch out for this resistance to be broken which would present a buying opportunity above 510 with a stop below 500 for a rise to 525. CNX IT at a new high and one of its top performing counters TECHM witnessed its best performing week as can be seen from the weekly chart attached. The sharp rise above its previous lackluster weeks suggest that the trend in this counter is getting set for some strong upside . The RSI too has inched up above 70 suggesting that the bullish momentum has gathered pace. Look to go long above 2310 and on decline towards 2275 maintaining a stop below 2250 for arise towards 2375. Banks have finally struck a chord and have begun to warm up.With the renewed enthusiasm in PSU banks this PSU banking major seems to be witnessing some strong participation. The long term trensdline support fuelled with the overall bullish sentiment makes this counter a strong banking contender for this week. Look to go long above 2530 and on declines bnear 2490 with a stop below 2460 for a rise to 2650 in the coming days. The sudden emergence of some trended action in the Commodities space has generated some interest across all counters. The active movement in the global counterparts has also fueled suddenly seems to have produced some trended action. Chinese PMI dipped to a 3 month low in August and being a major player in Metals one would have expected the repercussions to take effect on the prices. However the news was totally ignored as prices managed to reclaim the gap region highlighted in the chart below to stage a breakout. The momentum too seems to have revived and with the expiry coming up this week one can expect some rollover action to take place thereby producing some volatility in this commodity. A sustained move above 430 would be an invitation to go long for a rise to 440. Any decline towards 425 levels can also be considered for adding to existing position with a stop below 420. The measures taken by RBI combined with global decline in gold and oil prices helped the rupee stabilize leading to sharp appreciation in USDINR last week. This resulted in a positive impact on the equities markets as well thereby sustaining the bullish sentiment. On the daily time frame we observe that the prices have declined into the previous congestion area where we observe other sets of supports that could result in USDINR to rally. 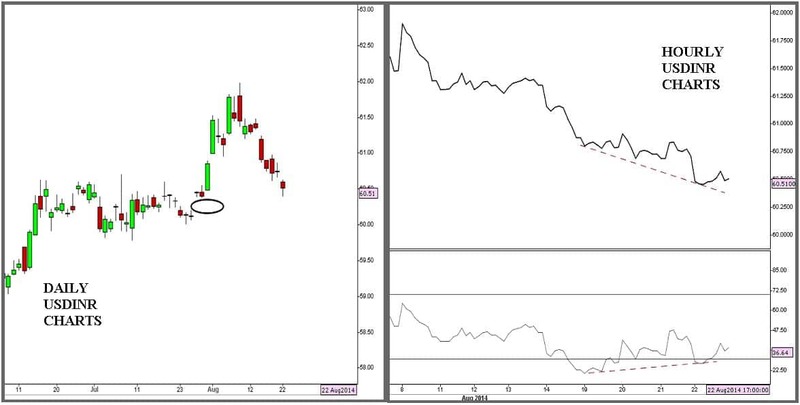 With intraday timeframes showing divergences one can expect an interim bounce in the coming week . The crucial point on the way down will be around 60.43 a breach of which could see some sharp declines towards 59.70 emerging. One could look to add to the existing short USDINR position if there is breach of the support levels mentioned with a sizeable decline in the offing. Sesa Sterlite Equity Buy above 290 stop 284 target 301. Achieved Metals saw some revival in trends leading to the targets being achieved. Cipla Equity Buy at current levels and on decline towards 442 with a stop below 438 for a rise to 464. Achieved Sharp momentum in pharma helped this counter move much beyond our targets. Bajaj Auto Equity Sell below 2100 for a drop to 2030 .The stop on this position can be maintained above 2130. Not Triggered This trade did not trigger as the supports managed to push this counter higher. TCS Equity a short below 2470 with stop above 2505 target 2405. Neutral As IT showed some signs of exhaustion last week this counter did move lower to about 2435 where one could have booked some profits. Crude Oil Commodity Go short at current levels and on rally towards 5950 with a stop above 6000 for a drop towards 5650. Achieved The sharp decline in Crude oil helped us achieve our targets. Copper Commodity Go short at current levels and on rally towards 422 with a stop above 425 for a drop towards 405. Stopped The trade declined marginally and then rebounded triggering our stoploss indicated. Not Triggered Trades that did not been initiated. Note* - Free Trial Users, please note that we require your valid credit card information for the free trial offer. You will not be billed unless your free-trial period ends. You have the option to cancel your payment anytime during the free trial period and the subscription amount will be credited back after the holding period of the bank.